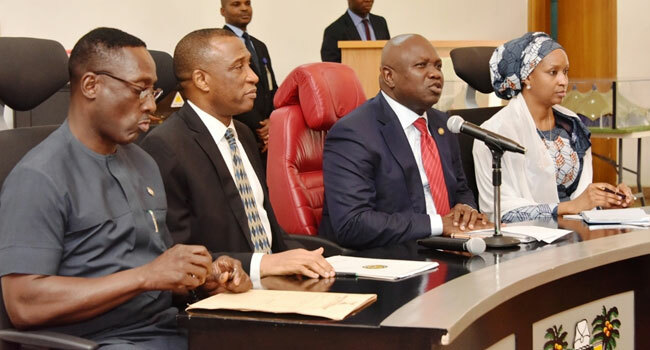 Lagos State Governor Akinwunmi Ambode (second right); Managing Director, Nigeria Port Authority (NPA), Hadiya Hadiza Bala Usman (right); Commissioner for Transportation, Ladi Lawanson (left) and Secretary to the State Government, Tunji Bello (second left) during the governor’s meeting with NPA, Tank Farm Owners, Shippers Council and other Stakeholders on the Apapa Traffic Situation at the Lagos House, Alausa, Ikeja, on Monday, July 23, 2018. The Lagos State Government on Monday announced that the joint security task force set up by the Federal and state government to clear trucks on the Oshodi-Apapa highway will continue operation for the next 30 days. The Commissioner for Transportation, Ladi Lawanson made this announcement while addressing journalists in Alausa, Ikeja. He said the decision was reached after Governor Ambode held a meeting with stakeholders in the maritime and transport sectors, including Nigeria Ports Authority (NPA), Shippers Council, Tank Farm Owners, Department of Petroleum Resources, Security Agencies and Clearing and Forwarding Agents, at the governor’s office. Lawanson stressed that the joint task force would work continuously for 30 days to bring sanity to the Apapa axis. He added that shipping companies sanctioned for non-compliance on utilisation of holding bays in the ports have also been extended by five days. Part of the resolution from the meeting includes that the State Government has directed that all truck and tanker owners must be duly registered and well regulated by their unions, adding that the unions would be held accountable for their adherence to extant rules and regulations. “The Nigeria Ports Authority (NPA) in collaboration with the Lagos State Government will going forward license trailer parks whereby only trucks housed in those designated parks will be granted access. “Furthermore, tank farms without adequate loading bays within the next 30 days will be sanctioned. To also cushion the effect of traffic gridlock, the Federal Ministry of Power, Works and Housing would immediately commence palliative measures on bad portions on access roads. The State Government also resolved to accelerate and complete work on the Bola Ahmed Tinubu Trailer Park in Orile within the next one month.